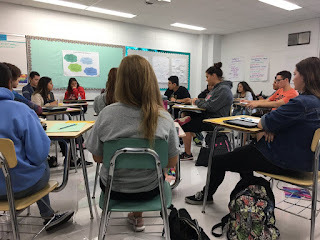 In previous work in Emily Mikuzis’ senior English 101 class, her students worked on exemplification—making a claim and supporting it with examples rather than reasoned evidence. In this case, students are using the guiding question “To what extent has your education served you?” with examples from their own experience. To prepare for this lesson students read and annotated an excerpt from Ta-Nehisi Coates’ “Between the World and Me,” which focuses on his experience in education—specifically compliance versus critical thinking. 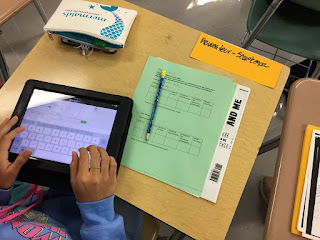 Students prepared by annotating form 4 different perspectives, color-coding each: urban student, suburban student, urban teacher, suburban teacher. They used Coates’ description of his neighborhood for the experience with urban schools and their own experiences with suburban schools. Understanding that this pulls on some biases, the class had a conversation on empathy, per While this is a limitation of the activity, the class talked through the nuances of each, handling it compassionately. For example, one student pointed out that just because someone has a certain identity, it doesn’t mean they only have one perspective or a common perspective.